Lisa Sanetra wins our first Hanukkah contest with her sesame twist on potato latkes. These latkes are dairy- and egg-free, so they're perfect for vegans too. Here's the recipe for Sesame-Potato Latkes: Ingredients: 2 large unpeeled potatoes, boiled; 1 clove garlic, peeled and minced; 1 tbsp. oil, plus additional for frying; 1 tsp. minced chives; 2 tbsp. bread crumbs; salt and pepper; 1/3 cup sesame seeds. Directions: Peel potatoes and mash until smooth. Add garlic, 1 tablespoon oil, chives and bread crumbs. Season to taste with salt and pepper. Mix well. Shape into thin latkes, using about 2 tablespoons batter per latke. Pour sesame seeds onto flat plate and press both sides of latkes into seeds to coat. In large, heavy skillet, heat 1/4 inch oil to 375 degrees. Carefully place latkes in hot oil and fry on both sides until golden brown, about 2 to 3 minutes per side. Drain on paper towels. Serve immediately with applesauce. Yields 2 to 3 dozen latkes. Gefilte fish, probably, especially with its clear, beige jelly. Maybe matzoh, when we're not talking about the eggy kind, thickly spread with cream cheese. P'tcha--calf's foot--for sure. Perhaps you DO have to be Jewish--or at least possess a dedicated omnivore's palate--to love some of the culinary icons of the Jewish kitchen. But not latkes. It's nearly impossible to imagine anyone unseduced by their crackly crunch outside, creamy centers within. And then there's that soul-satisfying rich spud taste. Except when there isn't. For even the most obsessed latke lovers have trouble eating potato latkes--at least the classic kind--all eight days of the holiday. Though potatoes and sizzling oil, like pumpkins and a fairy godmother, are a surefire recipe for magic (think Saratoga chips, French fries, hash browns...), potato latkes are not mandated for Hanukkah. The custom is simply to eat foods fried in oil. So, there are latkes made of sweet potatoes and of spinach, of apples and of chickpeas. And familiar potato comes decked out with cheese or even scallions and ginger, reminiscent of Chinese dim sum scallion pancakes. Click on RECIPES for three different latke recipes, and there are scads more in the book, plus Latke Lessons for foolproof latke-making. And check out A Festival of Latkes, my article in the December 2008 issue of Bon Appetit for Rosti-Style Potato Latkes with Rosemary and Brown Butter Applesauce; Spicy Cauliflower Latkes with Za'atar Aioli; and Butternut Squash Latkes with Sage and Pine Nut Yogurt Sauce. For our Hanukkah Contest, I invite readers to submit their favorite latke recipes. The winner will receive an autographed copy of Jewish Holiday Cooking. Submit your entries until December 24th. That will give you some time to try out your recipes during the holiday, and hopefully I can post the results in time for you to make a new latke during the remaining Frying Days of the holiday. Remember, Jewish Holiday Cooking makes a delicious holiday gift, and it's the perfect host/hostess present instead of same old, same old wine or flowers. If you'd like a book you've purchased inscribed, just email me the information, and I'll mail you personalized self-adhesive bookplates for you to put in the book. AND DON'T FORGET, TO ENTER A CONTEST, SHARE ANOTHER RECIPE OR SOME FOOD TALK, OR SIMPLY LEAVE A COMMENT, CLICK ON THE CONTACT BUTTON, THEN TYPE IN THE MESSAGE THERE. I am happy to announce that Barry Garber's elegant, dairy-free Plum Butter Challah Pudding is our Rosh Hashanah winner. Intense with fruity plum taste, it makes a light, but full-flavored finish to the holiday dinner when prepared with all egg whites; for richer tastes, whole eggs may be substituted for some of the whites. Judith Pettigrew's Grilled Figs, with its sweet, spicy, salty, and rich flavors, was California September in the mouth. Because it contains cheese, however, I thought that many readers would not be able to serve it at a Rosh Hashanah meal, which includes meat in most homes. Although I had not announced a contest for Sukkot, Judith's figs seemed a perfect choice for that holiday, as many families now see Sukkot as an ideal time to include some vegetarian meals to celebrate the harvest. So in a very non-Solomonic decision, I'm naming Judth the winner for Sukkot. She writes: "I am blessed to live in southern California and have several fruit trees on my property, including a fig and Meyer lemon. This recipe was tested with the very last of the figs on my tree and the very first of the ripe Meyer lemons." Make the Plum Butter: Halve the plums and remove the pits. Cut off any stem residue or other detritus. Quarter the black plums (if using prune plums, leave them as halves) and place in a Dutch oven. Add one cup of wine and one cup of water. Bring to a boil over medium high heat then reduce to medium. Cook for ten minutes stirring occasionally, partially covered if desired. The plum pieces should release their color, flavor, and sweetness by this time. Remove the liquid and reserve it. There should be close to two cups. Refresh the plums with an additional 1/4 cup wine and 1/4 cup water. Bring to a boil and reduce heat to medium-low, so that the plums are cooking at more than a simmer. Cover the pot. After about 25 minutes, check plums: they should be fork-tender, but still retain their shape. Remove nine tender plum pieces and set them aside to decorate the top of the challah pudding. Continue cooking the remaining plums over medium low heat until they become the consistency of plum butter. (Remove any plum pieces that do not soften completely and reserve for another use.) Remove from the heat. Trim and discard ends from challah. Cut bread into four thick slices and toast in a pan under the broiler, being careful to toast each side only lightly. Trim off and discard any hard crusts (soft crusts are fine). Spread challah with margarine, then cut into cubes. (You should have approximately six cups toasted bread cubes.) In a large bowl, toss the challah cubes with ¾ cup of the plum butter (reserve remaining plum butter). Make the custard: In a food processor combine 3/4 cup of the remaining plum butter and the reserved liquid. Blend thoroughly. Add 3/8 cup sugar and blend again. The egg whites (or egg whites /whole eggs combination) may be blended in the food processor or whisked into the plum butter-sugar mixture in a bowl. Stir in flavorings, if using. Add the plum butter-moistened challah cubes to the custard and allow them to soak for 1-4 hours. Transfer to a greased eight by eight baking dish. Glaze the top of the pudding with the remaining plum butter, and decorate with the reserved plum pieces (make a three by three matrix of plum pieces, and angle to the right). Sprinkle two tablespoons sugar over the plums to caramelize. Sprinkle almonds or chopped, blanched pistachios on top. Bake in a pre-heated 350 degree oven for forty-five minutes. Check for doneness (a tester inserted in the center should come out clean.) Remove from heat, cool for five or ten minutes, then serve. *Cook’s Note: About 12-15 large eggs will yield 1 ½ cups of egg whites. For a richer (and higher cholesterol) pudding, you may replace up to 1/2 cup of the whites–approximately 4-5 large egg whites--with whole eggs. Figure 1/4 cup egg white equals 1 ½ whole eggs; ½ cup egg whites would be about 3 whole eggs. Cut figs in half length-wise and place cut side up on a rimmed baking sheet. Lightly brush olive oil on the cut side of each fig half, then sprinkle with salt and a generous grinding of black pepper. Place the figs under the preheated broiler for about 5 minutes, or until the top halves of each fig are bubbly. Brush figs with honey and sprinkle them with the rosemary and lemon zest, then let them cool to room temperature. Spread baguette slices with either softened blue or goat cheese and top with figs. This year it might be buttery pears or midnight blue prune-plums. Foxy Concord grapes or the more customary pomegranates and fragrant quinces. As late summer rolls inexorably toward fall, Jews watch the produce markets swell with sweet treasures and then choose one. They save the fruit from this harvest season, hold off savoring it, so that when they bite into it at last on Rosh Hashanah, it will taste new and sweet: an edible metaphor for a fresh new start to a sweet year. It’s an edible metaphor in another way too. Rosh Hashanah is, by tradition, the anniversary of Creation. Tasting a fruit not eaten since it was last in season is like discovering it, and so participating, at least through our senses, in the brand-newness of Creation. From Chaim Grade’s story of his little mother, the fruitseller, who somehow found “the strength and patience to keep herself all summer long from sampling the fresh fruits in her own baskets” to Bella Chagall’s exotic pineapple trickling juice “like white blood” in pre-revolutionary Russia, Jewish literature is peppered with New Year’s tales of exquisite self-denial and extravagant indulgence. Living right by New York City’s Union Square Greenmarket, I am assaulted after summer vacation by the winy autumn smells, and every year, like a kid at a candy counter, I find it more difficult to select one fruit. 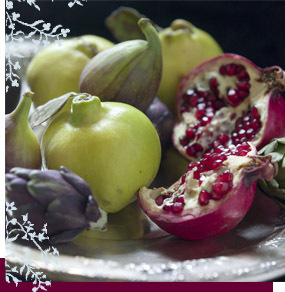 And so, sometimes I make a Rosh Hashanah menu featuring a lovely “new” fruit for each course. Click on RECIPES for two different “new fruit” recipes: Brisket Braised in Pomegranate Juice with Onion Confit and a simple Hungarian Plum Tart that is like a cross between a crunch and a crumble. For our Rosh Hashanah Contest, I invite readers to submit their favorite New Year recipe in any menu course (appetizer, main, or dessert) featuring the new fruit for the holiday. Submit your entries until the day after Yom Kippur (that gives you plenty of time during your harried holiday cooking adventures); the winner will receive an autographed copy of Jewish Holiday Cooking. If you already have a copy, it makes a great holiday gift. REMEMBER, TO ENTER A CONTEST, SHARE ANOTHER RECIPE OR SOME FOOD TALK, OR SIMPLY LEAVE A COMMENT, CLICK ON THE CONTACT BUTTON, THEN TYPE IN THE MESSAGE THERE. Jessica Dell'Era's evocative Pomegranate-Honey Kugel, which substitutes spaghetti squash for some of the pasta, is our noodle pudding winner. In Jess's words: "It combines four of the Seven Species of Israel (wheat, barley, figs, and pomegranates) and references the Song of Songs ('honey and milk are under your tongue' 4:11)--fitting for celebrating the gift of Torah and the marriage of the people Israel to God! The idea to replace half of the noodles with spaghetti squash came from my mother's newest diet (supposedly gluten-free, though that's really difficult to maintain) and the poor, unloved squash I've had sitting on my counter this week. No Shavuot symbolism there, though I'm sure if the ancient Israelites had known about spaghetti squash they would have invented something :)." Set 2 quarts of water to boil in large stock pot. Beginning at stem end, slice halfway through spaghetti squash. Place on microwave-safe plate and cook on High power 10 minutes in microwave. While squash cooks, add noodles to boiling water. Cook 3 minutes or until tender but not fully cooked. Drain well and return to pot. Add 2 tablespoons unsalted butter, mix until thoroughly coated, and set aside. Remove squash from microwave and cut in half lengthwise. Remove seeds and pulpy strings. With a fork, scrape sides of squash to collect “spaghetti,” placing in bowl. Add 2 tablespoons unsalted butter, mix until thoroughly coated, and set aside. Cut stem ends off figs and let stand 1 minute. Blot off bitter “milk” with a paper towel and slice figs into 1/8” sections. Save 20 slices for topping and set aside, chopping the remaining figs. Combine evaporated milk, condensed milk, eggs, honey, and pomegranate juice in large bowl, mixing vigorously until blended. Put noodles, squash, and chopped figs in nonstick/greased lasagna pan. Knead together, using fingers to separate clumps of squash and noodles, until evenly mixed. Pour milk and egg mixture evenly over top. Cover and refrigerate 4-8 hours. When ready for baking, preheat oven to 325ºF. To prepare topping, combine pomegranate juice and honey in small saucepan. Simmer over low heat, stirring occasionally, until reduced to ¾ cup (about 30 minutes). Uncover kugel and sprinkle barley flakes over top. Arrange fig slices evenly over top. Drizzle with pomegranate-honey reduction (if you prepared the reduction in advance and refrigerated it, microwave it for 40 seconds before drizzling). Bake uncovered 1 ½ to 1 ¾ hours. Serve warm. Okay, I confess: I’m not much for desserts. Even when the blues hit, I don’t drown my bitters with a sweet. I turn to heavy starches or salty treats instead. And at the risk of alienating, I admit I am never seduced by chocolate’s charms or ongepotchkeh desserts, like iced cakes or frosted cupcakes. But what I think of as “innocent” desserts are something else again: simple, buttery cookies and cakes (like poppyseed, or mohn, cake), fresh fruit desserts, milky puddings and other dairy indulgences. These are the delights of the Shavuot table, a time when summery fruits and rich dairy ingredients meet in the desserts I find irresistible. I’m particularly fond of noodle pudding, or kugel (a luxurious confection of pasta, eggs, butter, and milk or cheese or both) whose lush, melting texture is forgiving enough even for the most pastry-shy and invites lots of homey experimentation. I always prepare it in large quantities because leftovers make such wonderful brunches and snacks. I often top the kugels with lightly cooked, fresh seasonal fruits, and I favor lighter, less dense versions--more pudding than noodle. So I use just enough pasta for the pudding to hold its shape. And I let the kugel rest before baking for at least four hours or overnight: the noodles, bathed in the rich, sweet dairy ingredients, emerge meltingly tender and beautifully flavored. For our Shavuot Recipe Contest, I invite readers to submit their favorite ideas for noodle puddings up until June 12th, so you’ll have time to write up any discoveries made cooking or eating during the holiday. I'll send a copy of Jewish Holiday Cooking to the contest winner. Just click on the Contact Button and send your recipes, comments, or anything you'd like to talk about. Wishing you all a luscious holiday! For an intriguing discussion of real Passover lasagne and recipes, using homemade pasta made from matzoh cake meal rolled through a pasta machine, be sure to check out Chef Barry Garber's blog: http://passoverlasagna.blogspot.com. Then practice up for Lucullan pasta feasts next Passover! Matzoh brie can transform the lowly bread of affliction into a sensuous holiday treat. "Can" is the operative word here, because when prepared slap-dash or without sufficient rich ingredients (eggs, butter or a fine-tasting oil) to flatter it, it can taste like poor scrambled eggs tricked out with cardboard pieces to make it go further. When we get to the many possible matzoh brie methods, I'm always reminded of the old joke that goes something like: If two Jews are stuck on a desert island, how many synagogues would they need? Answer: Three--one for each to attend, and one neither would set foot in. Because there is not only the sweet/savory matzoh brie fault line, but also differences in technique: do you make it like a frittata, French toast, pancakes, or a jumble of crisp and soft--usually referred to as "scrambled-egg-style"? And many matzoh brie aficionados turn up their noses at whatever kinds were not written in their food DNA. Our family is pretty ecumenical--we eat it many ways. A savory artichoke matzoh brie might end up like a frittata, a lovely unbroken matzoh cake served for a brunch or side dish. Or we might enjoy a sweet, homey one made scrambled-egg-style, and mixed with sauteed apples, pears, and pecans, topped off with warm vanilla-maple syrup at a leisurely breakfast. Click on RECIPES for details on preparing matzoh brie, classic recipes and delicious variations. Sephardis look at sheets of matzoh and see soft crusts for savory pies or lasagne-like stand-ins to be filled with delectable layers of vegetables and meat or cheese--generally known as minas. Thick matzoh are often called for in foreign Jewish cookbooks, and when I first tasted the puffy, lace-like ones common in France and Italy, I could see why: when dampened with water or a more flavorful liquid, like broth, then patted dry, these matzoh hold their shape fairly well. So substituting them for pasta in a lasagne is easier. When using regular, thin matzoh, I find it easiest to lay the matzoh out in a single layer on sheets of plastic wrap, wax paper, cloth dish towels, or several thicknesses of paper towels. Moisten the matzoh with liquid (if using plain water, do season it with salt at least, since it is so difficult to breathe flavor into the blandness, and pat dry. Then lift the matzoh individually, using the plastic wrap, wax paper, cloth, or paper towels underneath them, to help so they don't fall apart, and place them in your prepared baking dish. For easy savory lamb and chicken minas from Turkey without the layering (more like meat matzoh brie), click on RECIPES. I'm throwing down the matzoh brie/mina gauntlet for our Passover contest. Please send in your favorite matzoh brie ideas or mina recipes. I'll send a copy of Jewish Holiday Cooking to the contest winner. Just click on the Contact Button and send your recipes, comments, or anything you'd like to talk about. Hag Someah and Happy Eating! For many of us, holiday foods are linked to family and friends now gone, and every year our recipes keep those we miss alive for us. Sheri Green's recipes tell the beautiful stories of her family: "My dad lost his parents at a young age, and one of his memories was making hamentaschen with his mom. My mother decided to continue the tradition, and managed to recreate some of her filling recipes. Every year we would bake the hamentaschen together and it was an all day project. Our favorites were a honey/walnut/cinnamon filling and a honey/coconut filling. I lost my mom a few years ago, but the hamentaschen live on as I continue to prepare them with my own children." I didn't have Sheri's exact recipes, so I just mixed amounts to taste, and particularly loved the walnut one, using chopped toasted walnuts, a light wild blackberry honey, cinnamon, and a generous pinch of salt. Since this is my first contest on the site, both Sheri and Allison will win a copy of my book for their entries. I promise to limit myself to one winner in future contests! Thanks to everyone who entered. Coming up next will be a matzoh brie contest for Passover. Details will be posted next week, so check back here then. And please drop me a line if there's any food talk you'd like to share about Jewish holiday cooking! Like muffins, bagels, and baseball players, hamantaschen have been pumped up to alarming proportions for some time now. A single bakery hamantasch these days might replicate the area of a modest paperback book, save only the fourth corner that the triangular pastry lacks. Super-size sweets and other mega-pastries so often go unfinished by kids; notwithstanding the gaudy appeal of Magnolia Bakery and its like, how many half-licked and partially nibbled cupcakes have you thrown away at children’s parties? But it’s not just kids. Many adults, myself included, simply get bored. After a few bites, most Big Cookies—crumbly or crisp—taste pallid and dry. Adding more filling to a hamantasch doesn’t solve the problem: hamantaschen are best when the wonderful interplay between bites of cookie crust and luscious filling is immediate. So I make my hamantaschen small, but in large batches. We’re not talking here about limiting intake, after all—you can always eat more of these delicate pastries. Shaping small pieces of the buttery dough can be tricky though—the warmth of my fingertips can make the pastry difficult to work with. So I keep the dough refrigerated when I’m not working on it, and I shape the pastry through a sheet of plastic wrap (see Hamantaschen Pastry in RECIPES). In addition to fresh apple, I make fillings of dried fruit and nuts or almond paste studded with dried cranberries. Others I think would be fun to try are a pecan-pie-type filling, a rich, sweet cheese one (like the lush inside of a perfect cheese danish), and perhaps a sweet-savory filling. Looking forward to reading and posting your hamantaschen ideas (or your recipes for my suggested fillings). I’ll send a copy of my book, Jewish Holiday Cooking, to the reader who sends in the best recipe. To send recipes or comments, please click on the Contact Button and enter the information there. Purim begins tomorrow, Thursday, at sunset and some last-minute bakers are still busy filling their hamantaschen. So, to give everyone time to send in recipes made over the holiday, final entries can be mailed until Sunday night, March 23rd. Winner and honorable mentions will be announced on Wednesday, March 26th. Meanwhile, if you want inspiration for your last batches, here's a sample of some of the luscious entries so far.